The Toronto and area marketplace behaved uncharacteristically in April. For the first time in many years, the number of sales this month was fewer than the number of sales reported in the corresponding month the year before. In April there were 11,630 sales of residential properties in the greater Toronto area, a 3.2 percent decline compared to the 12,016 sales that were reported last year. The immediate question is – has the Toronto resale market changed? In April, we also witnessed a dramatic increase in resale inventory. It was only a few months ago when inventory levels were 50 percent lower than they were a year ago. In just one month the negative variance was reversed. During the month, 21,630 new listings came to market, an increase of more than 33 percent compared to the 16,190 new properties that came to market in April 2016. At the end of the month, there were 12,926 properties available to potential buyers, 3 percent more than the 12,554 available last year. It should be noted that even with the substantial number of new listings that came to market in April, supply levels are still historically low. Notwithstanding, the proposed “affordable” housing measures and the plethora of new listings that came to market, prices continued to rise, and sales continued to take place at lightning speed. In April, the average sale price for all property types in the greater Toronto area came in at $920,791, the highest average sale price on record, and almost 25 percent higher than the average sale price reported last year. 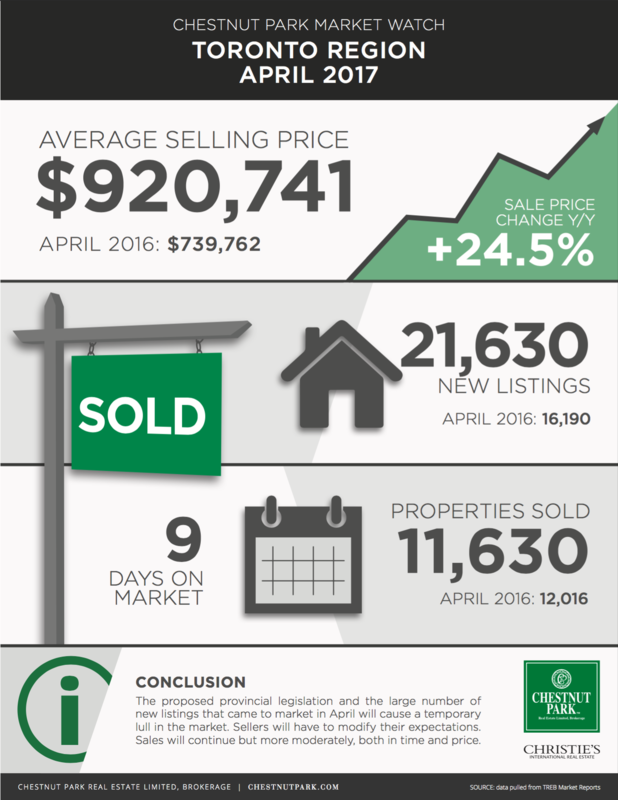 In April 2016, the average sale price was only $739,762, interestingly, an all-time high record at that time. Not only did all these property types, detached, semi-detached, and condominium apartments, sell at rapid speeds, but in every category, and at every price point, including the most expensive properties in Toronto’s central core, they sold for substantially more than their asking prices. There was not one housing type or trading area where the sale price was at or lower than the asking price. In many cases, the average sales price exceeded the asking price by more than 120 percent. Even though sales were slightly down (3.2 percent) year-over-year, the average sale price for every housing type was substantially higher. Detached properties in the city of Toronto came in at $1,578,542, up 25.2 percent. Semi-detached properties came in at $1,104,047, up by 22.4 percent, and condominium apartments came in at $578,280, up by almost 33 percent. In Toronto’s central core detached properties sold on average for $2,200,000 and semi-detached properties were not far off at $1,389,400. So what does all this data, some of it conflicting, say about Toronto’s residential resale market? Clearly, demand remains strong, and even though more properties came to market, inventory levels are still insufficient. If homeowners continue to bring properties to market at the pace and level that they did in April, supply levels might, for the first time in years, move towards a more balanced market. If that happens it will only be temporary. There simply isn’t enough supply to meet the growing demand in the greater Toronto area. With more than 100,000 net migration to the greater Toronto area annually, demand will remain high. Government legislation that was designed to curb urban sprawl has resulted in a severe shortage of low-rise housing, forcing buyers into high-rise condominiums at a pace that exceeds builders’ ability to deliver apartments to meet our housing needs. Consequently, with perhaps a “wait-and-see” lull that the new measures announced by the provincial government will create, we should anticipate that the Toronto and area market will remain robust, with average sale prices rising until they reach a point that simply renders them unsustainable. Until then, it is an arrogant and politically motivated government position, that it can deliver or control affordable housing. Toronto is not the only city in the world that no longer meets the long cherished yet, unrealistic arbitrary figure of 3 times gross household incomes as a reasonable benchmark for affordable housing prices. Infographic conclusion: The proposed provincial legislation and a large number of new listings that came to market in April will cause a temporary lull in the market. Sellers will have to modify their expectations. Sales will continue but more moderately, both in time and price.